*coughs* anyway. 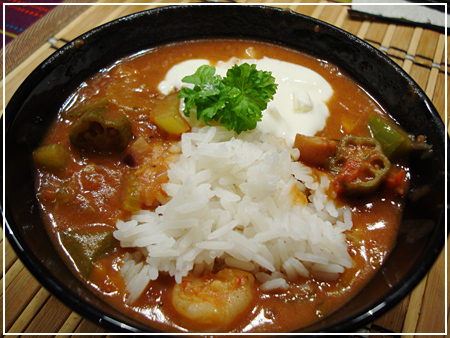 I just recently learned about Cajun and Creole cuisine and got this nice seafood gumbo recipe from an online friend that I had to try out :D It came out quite tasty! 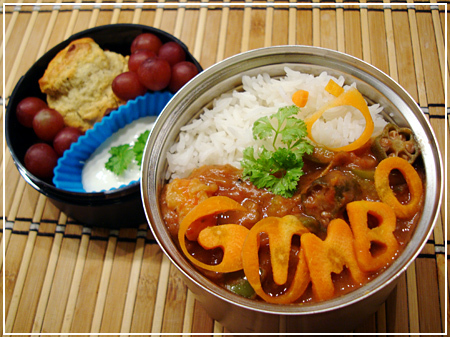 Gumbo with jasmine rice, parsley and carrot decoration (GUMBO :D). That should be more than enough food for lunch already so the small container only has some yoghurt mixed with lemon juice for stirring into the gumbo and a muffin and some grapes for breakfast. Same for the BF. The M stands for his initial. …quite, quite yummy. :D It’s a very basic recipe that can technically be made with any meat, but I had alaskan pollock and shrimp in mine, plus fish stock I had prepared earlier and frozen. 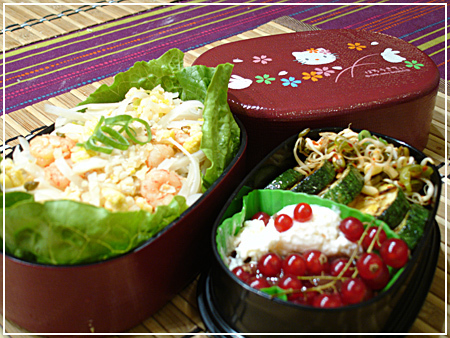 This bento contains a lot of leftovers from various meals during the weekend. Raw corn-on-the-cob flowers on fried tofu (hidden), carrots, and fried breaded squid on chinese cabbage. 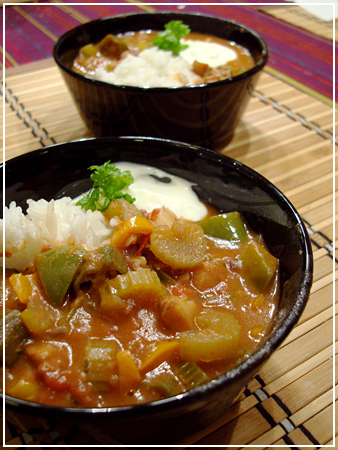 The upper layer contains rice with sweet-n-sour sauce. BF’s bento contains the same, plus a toffee. His sweetnsour is supposedly in the shape of a heart, but you can’t really tell… oh well. There was a challenge on my bento community, and the theme was Sci-Fi TV shows. I love Sci-fi, so I had to participate – and not once, but three times even! I was so impressed by the bento of Leiji Matsumoto’s character Queen Emeraldas posted on JList that I set out to do a Queen Millennia from the series of the same name after all. 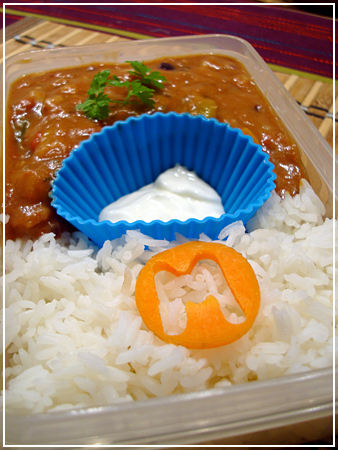 This was my BF’s bento today (well, the photoworthy part of it). Face done with sushi rice colored with a tiny drop of gochujang; Hair from omelette; Body is a riceball with Nori, the deco is red bell pepper, nori and cucumbers. Avocado, cucumber and egg sashimi surrounding some sushi rice with an inari cutout. …and if you can’t recognize this one, you have lived under a rock in the 80es. Hint: why does the cat have a sweatdrop? 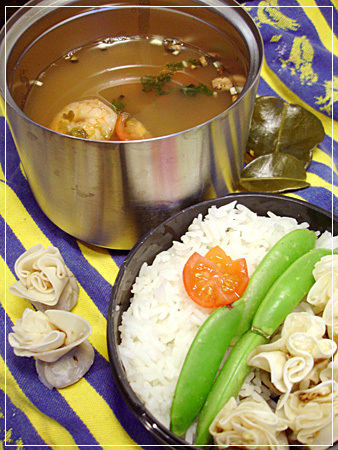 Saffron&seafood risotto with peas and spring onion deco; more seafood; Parmesan in the bowl; candy. Character(s) from Doctor Who, of course. Not too happy with how the Dalek came out, I had trouble shaping the riceball the way I wanted. I also have the feeling I’m more suited for the pretty arranging of interesting components than for the riceball sculpting. Just too practically minded! Oh, and I seem to be nearing a 100 (posted) bentos! That’s not counting some boxes I was not proud of and breakfast posts. Wonder what I’ll make for the big 100? Mmm, sushi. I like to make sushi on sundays – it’s the only day where I can safely spend lots of time on cooking! Big compartment: Maki rolls (California and leek-mayo-avocado-cucumber), tamagoyaki, a pickled ginger rose with wasabi hidden underneath, miso balls with leek and seaweed. Small compartments: Inarizushi, frozen mango and strawberries for dessert. There is also a big fish bottle of soy because I like having a lot of condiments. Inarizushi is the way my friends hooked me on sushi. The sweet-tasting, delicious tofu pouches are just the right thing for somebody cautious of the taste of nori and unused to the delicate taste of the other ingredients. Talk about a flavour bomb! After that, I got to try vegetarian kimbap: Kimbap is Korean rolled sushi, which is usually stuffed with a LOT of ingredients of different tastes, most of which are slightly pickled to increase the taste.